The construction of transport corridors and logistics capacity building are expected to be prioritized among the agendas of the upcoming 4th Eastern Economic Forum hosted by Russia, as China and Russia are working on transport corridors for win-win results. During the forum to be held from Sep11 to 12 in the city of Vladivostok, Russia, energy cooperation, trade of agricultural products, marine economy and regional development will be important topics for discussion. 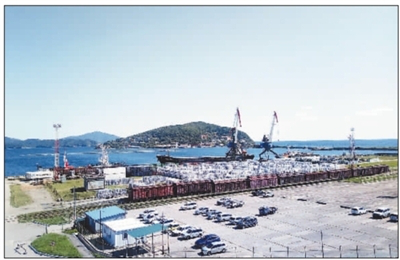 Located in Russia’s Far East region, the Zarubino port is in Russia’s border area with China and the Democratic People’s Republic of Korea (DPRK). It is an important port for foreign trade and transit transport in the Asia-Pacific region. The sea mouth of the Binhai 2 international transport corridor, which aims at becoming a transit transport passage between China and Russia, is located in the same place. This August, China’s General Administration of Customs approved the plan to open a sea route from the port of Hunchun-Makhalino railway to Zarubino port. It takes about 15 days to make a round trip on the Hunchun-Ningbo sea-rail line which passes through Zarubino and Busan. Gao Ming, general manager of Jilin Province Northeast Asia Maritime Silk Road International Shipping Co., Ltd., told People’s Daily that maritime transportation of domestic trade that passes through foreign ports is a highlight of the transportation corridor. The model is expected to boost capacity and reduce costs. For instance, it took much money and time to send agricultural products from Jilin in northeast China to astern Zhejiang, as the capacity of land transportation was limited, he elaborated, adding that fortunately, the opening of the maritime corridor would offer a better choice solvingthese problems. Gao said that cooperation on the transportation corridor would benefit both China and Russia. “On one hand, Chinese enterprises can introduce various resources from Russia’s Far East region, and build a passage for transportation of commodities to help Jilin to be better connected with other provinces and neighboring countries in chemical, automobile and agricultural industries,” he pointed out. On the other hand, the development of the port would bring more transit trade and employment to the Far East, and open up a larger space for export of Russian products, he added. As a matter of fact, the Russian side also has a high expectation for the port to drive up economy of its Far East region. A Russian official noted that co-construction of the Binhai 1 and Binhai 2 international transport corridors by China and Russia was an important outcome of the alignment between the Eurasian Economic Union and the Silk Road Economic Belt Initiative, as well as a new phase of common development of Russia’s Far East region and northeast China.